Home heaving lines with sandbag or monkey fist. Heaving lines, sandbag or monkeyfist. Heaving lines can be produced in various lengths, diameters and material. As a heaving line rope we normally supply 8mm in diameter. Both in 3-strand construction or doublebraided construction to match the mooring lines. Depending on the customers wishes we use polyester which is nice, soft and flexible or polypropyleen which is lighter, and even floats. Although of course the monkey fist or sandbag will make the rope sink again. 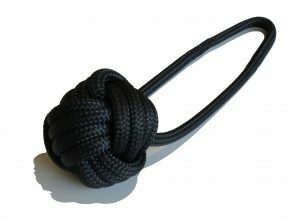 Our favorite is the 8mm black doublebraided polyester with a monkey fist at the end. This rope just provides the right weight for a good throw. 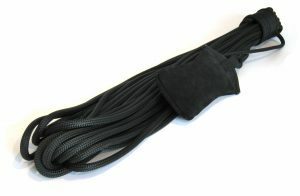 The monkey fists we supply have a 40mm SS core and a 8mm overbraid. The alternative would be our sandbags, made of soft leather and a piece of webbing for easy attachment of the heaving line without the risk of scratching with metal parts. We supply the heaving lines in combination with our mooring lines. Please contact us for any questions or enquiries. Not looking for a custom solution? 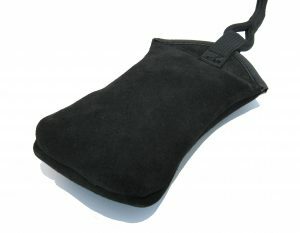 Have a look at our stock leather sandbags.